1. Put the onion, peppers and stock in a saucepan and bring to a gentle simmer. Cover with a lid and cook for 5 minutes. 2. Add the ham hock, sweetcorn, red kidney beans and half the coriander. Return to a gentle simmer and cook, covered, for a further 10 minutes. 3. Place the remaining coriander, radishes and avocado in 3 separate serving dishes. Drizzle the lime juice over the avocado. Ladle the posole (Mexican-style stew) into shallow serving dishes and serve with the garnishes for stirring in. 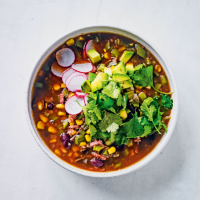 Cook’s tip For a vegetarian posole use vegetable stock instead and stir in ½ tsp smoked paprika for a punchy flavour.